We offer qualitative range of Dry Stoners. 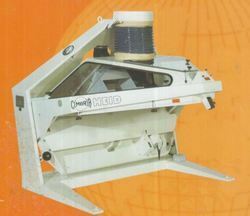 These are manufactured by using cutting edge technology and strictly adhere with the global standards. In our effort to provide premium range, we are also supported by a team of quality analysts. They meticulously check De Stoners on various quality parameters. 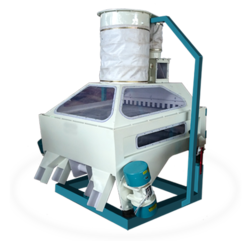 Dry stoners find their application mainly in food processing sector and in the milling industry, but they are also used on the seed sector especially on products being harvested close to the ground. They are used to separate granular material according to the specific weight into two fractions and in dry material condition. Target is the elimination of heavy impurities, such as stones, metallic particles and others from e.g. coffee, grain or pulses. The granular material to be separated is taken to the table deck in the conveying direction through an adjustable spring-actuated flap. Depending on the grain size, the deck surface is covered by a fine-meshed or a large-meshed wire cloth, through which a steady and adjustable airflow is aspirated.The combined effect of the shaking movement and of the air passing through the deck causes an arranging in layers of the material flowing in (- fluidized bed principle). 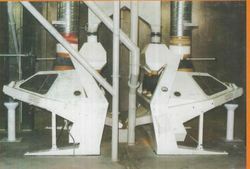 The heavy admixtures sink towards the bottom and are moved to the highest point of the table deck surface by the contact with the rough deck covering. The clean product floats towards the top of the layer and flews, against the conveying direction of the table to the lowest point of the deck surface, the clean product discharge. In the outlet area of the heavy particles, a unique “counter-air flow zone” avoids the clean product from being discharged into the heavy particles outlet during operation. The dry stoners have a capacity up to 20 t/h depending on model and product. For aromatic products or for implementation in closed rooms, Cimbria can offer an air recirculation system which circulates app. 80% of the process air. Further, an automatic clean out system can be offered for applications with frequent change of incoming product (batch operation) to reduce down times. To furnish the diverse requirements of our clients in the best possible manner we are involved in offering an extensive range of Dry Stoner. To furnish the diverse requirements of our clients in the best possible manner we are involved in offering an extensive range of Ts Dry Stoners. Looking for Dry Stoners ?